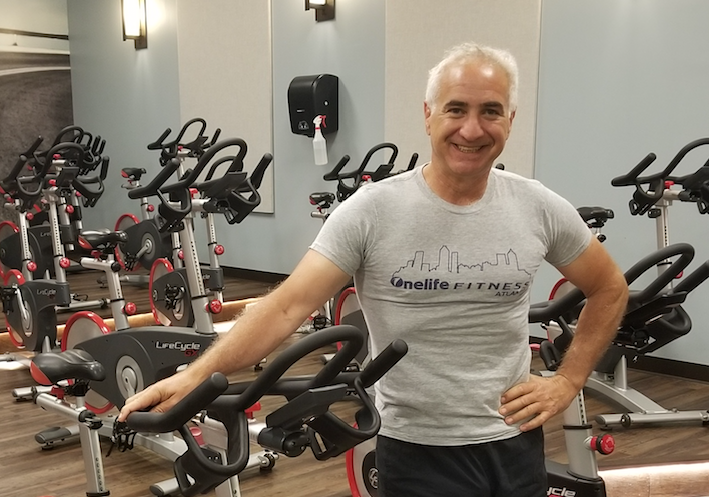 Meet Mitch Kaminer, age 52 of Onelife Fitness. Mitch's incredible health and fitness journey has taken him from 220 pounds to 179 pounds - a loss of 41 pounds total! Keep reading below for more info on Mitch's progress and his secrets to success. How long he's kept it off: He started in August 2017 and reached his current weight in May 2018. Turning Point: "I decided to stop drinking alcohol in August 2017," Kaminer said. "I looked at myself one day and thought: 'I don't like what I see. I don't feel good this way. I'm better than this." Diet Plan: He starts his day with a banana and protein bar. For lunch, he has a chicken salad wrap or salad with chicken. Dinner varies, usually fish, chicken or lean meat. Exercise Routine: "I would say on average six days a week...between yoga, spin classes, weight lifting, singles tennis and I do long-distance bike riding," Kaminer said. "I go between 45 and 50 miles on a Sunday morning." How Life has Changed: "My weekends are longer because I am waking up earlier," he said. "The best feeling in the entire world is that I can put clothes on and they are loose on me. The worst feeling in the world is putting on pants that are too tight and you feel like crap. I would never encourage anybody to do a diet. For me, it is a complete lifestyle change. In August of 2017, my blood pressure was 175/85 and now, I'm 117/70. It went down to phenomenal levels! For me, it is psychological - there is no way that I would ever let myself gain weight again." Want to share your fitness journey with us like Mitch? Post your story on Instagram and tag us using #IHaveOnelife for a chance to be featured on our digital marketing.